Symmetric Multi-Processing (SMP) computers with large shared memory and many processor cores are perfect for Big Data and high-performance computing applications that utilize large in-memory datasets. They are also essential for hosting large database installations, and financial, accounting and other critical enterprise software. The high cost of large SMP computers has limited their deployment to the central IT facilities of large corporations and to government national labs. Even in these environments, only critical applications are hosted on these machines. Symmetric Computing has developed large SMP computers that are a fraction of the cost of currently available machines. Symmetric Computing creates departmental supercomputers and departmental mainframes by starting with a tightly coupled cluster of state-of-the-art, industry standard server hardware, connected by Infiniband. A cluster operating system based on a standard Linux distribution is included. This cluster operating system uses a Linux kernel with distributed symmetric multiprocessing (DSMP) extensions that transform the cluster into a single server image supercomputer. The SuperCluster is a marriage of shared memory mainframe and cluster computing technology. 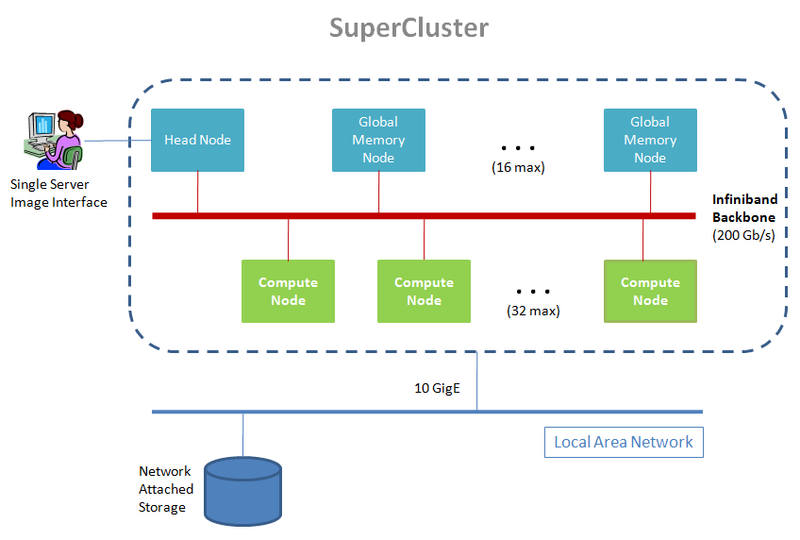 A generalized view of the SuperCluster architecture is illustrated in the following diagram. The Symmetric Computing supercluster is designed to serve both the mainframe and high performance computing markets. Up to 16 terabytes of global shared memory and 2048 processor cores is supported. In addition, each compute node can host four GPU cards.